kazuma « Japan, Hockey, Baseball, etc. The JIHF announced their U20 team for the upcoming U20 Div II Group A tournament in Romania in mid-December against Korea, Serbia, Belgium, Lithuania, and hosts Romania. All but one of the players on the Japanese U20 team are first year university players. The lone exception is Kazumasa Sasaki who is an Asia League Oji Eagles player on a (probably) one year assignment in Swedish Division I with Östersund Hockey, and he is proving himself to be a useful player scoring 6+4=10 from the blueline in 16 games at the tender age of 18. Sasaki has yet to play a game for the strong Eagles side, but I expect him to be back with his Japanese team next season as this season in Sweden is probably all expenses paid training by Oji (similar situation to many Japanese players in the past, including Masahito Nishiwaki with the ECHL Dayton Bombers last season. Japanese players truly testing and developing their talents overseas at the pro level can sadly be counted on one hand… Yutaka Fukufuji and Kazuma Takahashi, both in the ECHL, and maybe CHL overager Takuma Kawai.) Only playing one season overseas almost seems like a waste of resources as the player just gets acclimatized to their new environment when they get called back to Japan, shame. But financial security of playing in Japan is just too comforting and secure to get more players to truly challenge themselves and develop overseas long term..
Deanna has another great interview, this time an insightful and long interview with the veteran (of NPB and other leagues) Fernando Seguinol. The Fighters in Sapporo Dome, Shinjo, playing in various countries, his travelling season so far, playing for Katsuya Nomura, different approaches at the plate playing for different organizations in different countries, learning the language, etc. all very interesting stuff. Update from the Seibu Prince Rabbits equipment manager about their Bavaria training camp. The team lost again, this time to a team in the second tier German league, but apparently the goalie Kikuchi is playing well and even received applause from the local fans. The defence must’ve been really porous giving up lots of shots. Anyways, there’s a funny anecdote (with pictures) about how him and another player went swimming in the cold lake after the team cycled up to the castle at Hussen. Most players are not strong swimmers because most Japanese hockey players are from Hokkaido where they don’t have swimming during phys ed. I’ll do a wrap on their Bavarian trip after their last game on the 31st. Japan NT and Seibu player Ryuichi Kawai has some pictures up from their Ingolstadt game, the atmosphere does look amazing, his brother Takuma is the first Japanese major junior player and is on Gatineau. One time LA King, and current ECHL Bakersfield Condors goalie, Yutaka Fukufuji visited Oji Eagle Kei Tonosaki in Tomakomai. They both entered Kokudo (which merged with Seibu) at age 18 and are now 26 year olds, how time flies. Fukufuji blanked a visiting Team Canada (Allan Cup winner, best amateur team in the country) in a warm up game in Tokyo before a Nagano Cup some years back, I guess that would be around 2000, when he was still a high schooler. Kazuma Takahashi explains his current situation, having to train alone because he’s not on any team yet, and how team building works differently between Japan/Europe and North America. In Japan and Europe the team is set during the off season, but in North America only the core of the team is set during the offseason, and the rest are based on tryouts during training camp, that’s how he ended up on the ECHL Utah Grizzlies (which was a step or two up from the previous season he spent in the SPHL. Good luck on the upcoming season to all the players! And, back to baseball, former Hanshin Tigers ace Kei Igawa has proven himself a true ace in America as well… in AAA. His numbers so far are 13-5, 3.55ERA, 6.92K/9, 2.64K/BB, 1.19WHIP. But got whipped around in his brief MLB stint again with 13.50ERA in 4IP in 2 appearances. Note to Japanese pitchers trying to break into the majors, you need something more than a decent fastball, mediocre location, and a good changeup. Now that the Spokane Chiefs have been crowned as the Memorial Cup champs, Gatineau Olympiques’ Takuma Kawai’s season has ended, along with the seasons of all Japanese players in North America. Here are their 2007-08 stats. Kawai played regularly on the powerful Olympiques team, but was converted from forward to defense with 15 games left in the season. He only managed 1 goal in the Q playoffs, but got 2 assists and was an even +/- 0 at the Memorial Cup. Hopefully his appearance in the Memorial Cup sparked an interest in some NHL teams to take a flyer on him with a late round pick. The five-foot-11, 190-pound Kawai is actually a forward who was moved to defence in February because of injuries on Gatineau’s blue-line. He made an impact in Monday’s Memorial Cup loss to Belleville with two assists. He’s a role player with a feisty, hard-hitting style _ hence the missing teeth _ which are desirable qualities whether he plays forward and defence. 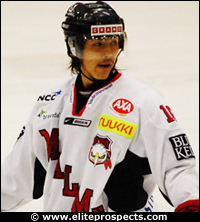 Kawai’s older brother Ryuichi Kawai is a defenceman for the Seibu Prince Rabbits of the Asian Hockey League. The younger Kawai started following his brother to hockey practice when he was three years old. Nishiwaki is one of Japan’s top forwards and among the league leaders in scoring (more than a point per game) when he was in the Asia League. It took him some time to establish himself on the Bombers, but being 6th on the team in scoring, he was an important player. Hopefully he’ll challenge himself overseas again, as this was only his first season in the States, and he should be better adapted to the minor league hockey environment next season. After Dayton lost out in their best of 3 first round series, Nishiwaki came back to join Team Japan in time for the World Championships Division I in Sapporo where he scored 2 goals in 5 games. Takahashi was more of a role player back in Japan where he scored less than a point per game but had at least 1 PIM per game (119 PIM in just 41 GP in 2004-05). He managed to hang on for a full year on the Utah roster, even though he was scratched for many games and was asked to be a role player with limited ice time when he got into games. Hopefully he’ll get another crack at the ECHL next season, as he definitely took a step up from the previous season when he played in the SPHL. Fukufuji was lucky enough to get called up to the NHL the previous season when the LA Kings didn’t want to risk putting Jason LaBarbera through waivers where he probably would’ve been picked up by another team, as he was absolutely dominating the AHL then. Anyways NHL proved to be way beyond Fukufuji’s level as he was shellshocked into 4.37 GAA and .837 Save % in 4 games before being sent back down. Yutaka had a reasonable season and excellent playoffs despite being on a weak team (hence the unimpressive numbers). Hopefully the team in front of him will be better next season, and if he continues his solid play, maybe he can get some time in the AHL between the pipes. I’m interested in seeing what he can do at that level, as he’s proven himself in the ECHL over 5 seasons (including parts) already. Fukufuji almost singlehandedly won the first round of the ECHL playoffs for his Bakersfield Condors against the Victoria Salmon Kings, but he was spraygunned with 61 shots, so it would’ve been a true miracle had the Condors won, as Victoria was truly superior in every other facet of the game. Fukufuji intends on playing in North America again next season, hopefully he’ll get a chance with an AHL club. Every party has a spoil-sport and this one almost did, too. His name was Yutaka Fukufuji. The Bakersfield Condors goaltender was the reason the Salmon Kings were forced into overtime for the victory. Fukufuji, the first Japanese-born player to play in the NHL, almost single-handedly forced a Game 7. Regulation time was dominated in almost every facet by the Salmon Kings. Every aspect except one — goaltending. The shots clock at the end of regulation time read a glaring 57-23 in favour of Victoria and ended 61-25. “He [Fukufuji] stood on his head all series and kept them in it,” said Goldie. But the dominant Salmon Kings not only had to solve the gallant crease efforts of Fukufuji, they had to do it by contending with five against-the-grain goals by the Condors that kept pulses pounding amid the deafening din caused by the near sold-out crowd. Despite holding a wide edge in play, the Salmon Kings had to fight back from 2-0, 3-1 and 4-3 deficits. But after finally taking a 5-4 lead on third-period goals by Marc-Andre Bernier and Ryan Wade, the Salmon Kings saw the opportunistic Condors tie it 5-5 on former Senators draft-pick Andrew Ianiero’s fifth goal of the series at 13:16 of the third period. In a game in which the shots were flowing for them like winter-rain water out of the Sooke Reservoir, the S-Kings were forced into the strange and painstaking position of trying to climb back into a game that might have turned into a blowout against a goalie of lesser calibre that Fukufuji. Bernier had two goals for Victoria and Wade, Chris St. Jacques and Paul Ballantyne one each. Ianiero led the Condors with two goals. But the biggest goalbelonged to the tricky Goldie in OT, who took a lovely two-on-one pass from Estrada and made a move around Fukufuji that was truly worthy of a golden goal. Now the Salmon Kings are facing the Utah Grizzlies in the second round. The Grizzlies feature Japanese forward Kazuma Takahashi, but he was a healthy scratch and didn’t make the trip up to Victoria for the first 2 games of the series, which the teams split with blowout scores of 6-0 and 1-6. As reported earlier Nishiwaki’s Dayton Bombers lost the best of 3 mini playoff round, so he flew back to Japan in time to play in the World Championships Division I B which was hosted by Sapporo. He played well in the tournament, but it was not enough for Japan to advance to the top division as Japan finished a strong 3rd in the tourney.